Let’s team up again to raise awareness of rare bone diseases and fundraise for the National, Hungarian Federation of Patients with Rare and Congenital Disorders. Colleagues from the industry are also invited to join us. Each team should have 5 players and up to 3 substitutes. 2 out of the 5 players of the team should be female. Each team should be composed of players from different countries. HINTS: Bring along some sportswear (changing rooms are available at the sports center). We recommend that members of each team wear the same colour T-shirt. 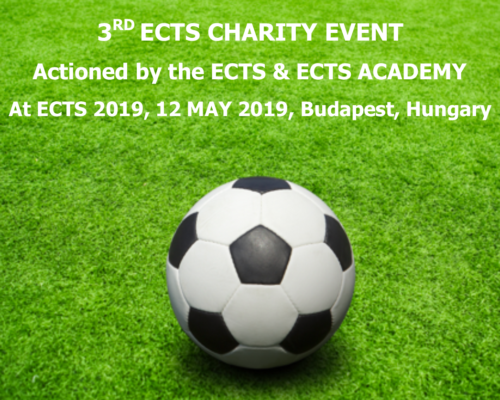 Join us for the ECTS Fundraising Football five-a-side event! Please provide us with a mobile phone that you will use in Budapest. This will be used only in case of last minute communications. By registering, I agree to pay a fee of €10 and I acknowledge that ECTS and its agents will not be held responsible for any loss or damage incurred during the football game.